Community health workers (CHW) play a critical role in improving access to and continuity of care and treatment in countries worldwide, particularly in low- and middle-income countries where there is a shortage of skilled health service personnel. CHW have long played diverse functions in health care delivery at the household and community level. Worldwide, CHW have provided support for TB treatment, home-based promotion of family planning, and home-based support of child caregivers (Lewin et. al, 2010; Haines et. al, 2007). In South Africa, as in many countries, CHW play diverse roles in health care delivery at the household and community level (Schneider & Rensberg, 2008). While the profile of CHW in different settings varies with respect to gender, age and education, CHW generally receive limited training in health science topics (e.g., HIV, tuberculosis [TB], nutrition, danger signs in pregnancy, danger signs of illness in neonates and children), have minimal knowledge about current guidelines regarding best health practices (e.g., infant feeding guidelines, HIV or TB treatment guidelines), and no formal training in the art of interviewing caregivers concerning their children’s health and health care. Under prepared and poorly supported, CHWs must learn on the job to ask and respond to questions, listen to individuals’ concerns about themselves, their children and other family members, determine whether there should be clinic referrals, and provide support under challenging circumstances. 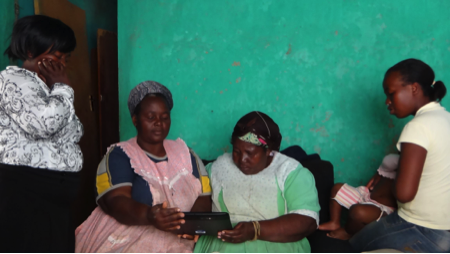 Mobile technologies can offer support to CHW in terms of their adherence to home visit protocols, data collection, and communications with program and clinic officers. “mHealth innovations” have been advanced for supporting data collection, sending and receiving text messages between clinics and clients, or sending automatic referrals or alerts (DeRenzi et al, 2011; Curioso, 2007; Feder, 2010). 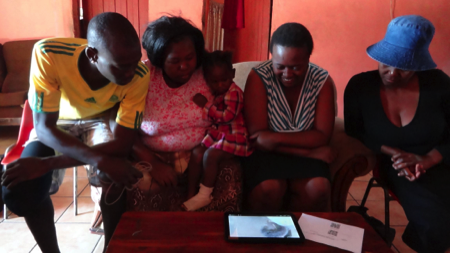 However, achievements in mHealth have been narrowly focused, and the use of mobile technologies to support CHW interactions during home visits is recognized as an unmet topic (Mechael et.al, 2011). Moreover, the mHealth research community has not generally pursued an inclusive design methodology (e.g., participatory methods). Our project, called Community Healthworker Assistive Technologies (CHAT) began with the recognition that we could employ tablet computers as a scaffolding environment for CHWs during the home visits, when they need it most. Our system would actively promote CHW learning about the relevant health topics and the best way to discuss those topics with household members. CHAT emphasizes the use of educational media (videos and animations) that promote discourse among CHW and household members. We hypothesized that, by watching these videos together household members and engaging in the ensuing discourse, CHW would develop new understandings about health science and health behaviours, as well as improved pedagogical techniques. CHAT consists of a tablet computer that includes the usual “mHealth” features, such as smart data forms (to support accurate collection of data), bi-directional communication with clinics, GPS tagging of households, and more. 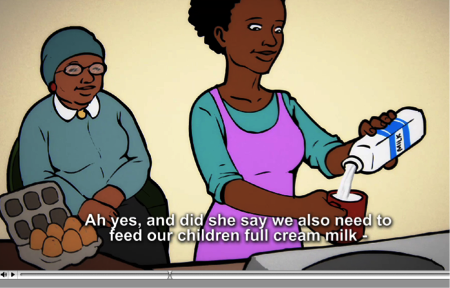 But at the center of our design are a set of educational videos and discussion prompts that support CHWs as they engage in discussions of topics in maternal and child health in HIV-affected South African households: including nutrition, danger signs of childhood illness (e.g., diarrhea, respiratory illness, sepsis, malnutrition), child development, and HIV including adherence to antiretroviral medication and administering medications to children. Over the past two years, CHAT has been developed using a participatory approach, in close partnership with Thandanani Children’s Foundation, a non-governmental organization (NGO) that provides CHW services to highly vulnerable households, and Jive Media Africa, a media design firm that specializes in culturally appropriate health education materials for African communities. These two partners, together with our academic research strengths in population and behavioural sciences, maternal and child health, and educational technologies, have supported a design process including household visits and CHW interviews, focus groups, knowledge engineering of the workflow of the NGO (i.e., household visit protocols), and iterative design and development of media materials and user interfaces. CHAT has been designed to provide a situated learning environment for CHW that supports household visits, including discussions with mothers and other caregivers, and continuity of care between clinics and households. CHAT supports CHW in a carefully designed sequence of interactions, providing data “forms” where relevant, prompting for questions and supplying clear, contextualized media resources (i.e., health education videos, or animations) that serve to scaffold the household visit. Thus, CHAT supports CHW as they engage in relevant practices, ensuring adherence to established household visit protocols while promoting discourse to build knowledge, confidence and autonomy. CHAT also supports data connectivity with clinic-based health providers, including referral of patients to facility-based clinical services, and access to continuity of care documentation relevant to the CHW visit. CHAT was created through a participatory design methodology (Hoadley, 2002) by a multidisciplinary team with expertise in the areas of maternal and child health, media development, CHW programs, and mobile technology learning environments. We began with field observations, protocol revisions, focus group meetings (of CHW and also HIV-affected mothers), which led to scenarios, prototyping and pilot trials. These observations (see Figure 1) provided more solid images of the end user environment. Figure 1. In top panel, CHW at left watches as three generations of women watch a video on maternal health. In bottom panel, CHW at center in striped shirt sits with large family. In order to introduce a tablet technology into any NGO, our intervention must fit within the ecology of work already established within that organization. To that end, we interviewed CHW individually and in focus groups about the nature of their job, their perceptions of the household visits, and the prospect of a digital support tool. We organized focus group meetings for CHW, and separate meetings for their supervisors, to collect perceptions of the current work, of the potential for new technology, interests and concerns about the project. We also held a focus group for mothers and caregivers of children, to hear what they felt were the most important roles for the CHW and health concerns for their families and community. The research proposal for CHAT made a clear commitment to advances in CHW knowledge of four major health topics: nutrition (including breastfeeding, early childhood diet, and overall nutrition and health); child development (age 0 to 9 months, 9 to 24 months, and 2 to 5 years); danger signs of childhood illness (respiratory, diarrheal, malnutrition, sepsis); and HIV (HIV testing, viral load, CD4 count, adherence to antiretrovirals (ARVs), administration of ARVs to children). We began by developing a matrix to capture the key health messages for each of these primary areas, which were derived from a comprehensive review of available guidelines and materials (e.g., from UNICEF, Word Health Organization and Hesperian). Working in close cooperation with Jive Media Africa, we next developed a social context in which to situate our designs of educational media. 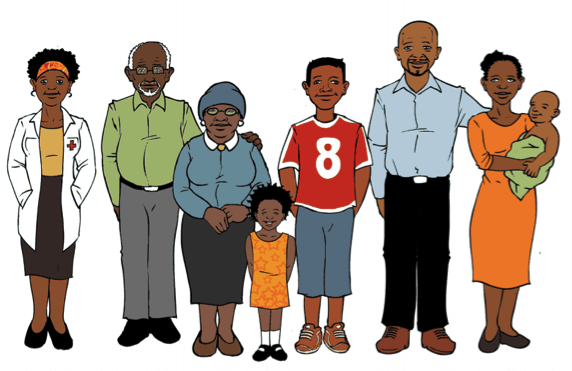 This consisted of an extended Zulu family, including grandmother, grandfather, mother, father, daughter, son, and children (see Figure 2). The elements of this family were developed with input from participants in focus group sessions so as to develop images that reflect recognized cultural elements (including age, hair style, clothing, etc). Focus groups were convened to reflect on several versions of characters, collect feedback, and inform the final design. Figure 2. The “CHAT family” – provided the social context for the development of CHAT media. Equipped with a well-designed and vetted social and cultural context in which to situate our media, we proceeded to develop narratives for each of the core health topics, targeting the specific health messages in Table 1. The design and development of educational media was performed by Jive Media Africa, who specializes in this form of media production. The resulting media, in animatric form, are short, engaging, and visually compelling. All scenarios and settings are carefully designed with culturally appropriate content and accessible language and conceptual content. All media were pilot tested with focus groups and individuals, and matched to discussion prompts that appear before and after the media. Figure 3. Screen-shots from animation videos on nutrition (top) and child development (bottom). Media are developed to target key health messages, and are supported with discussion prompts for CHW and caregivers. This process has now yielded the first version of CHAT, to be used in a randomized control study of feasibility in January, 2014. To see more about CHAT, go to the project Web page. Curioso WH KA (2007). Access, use and perceptions regarding Internet, cell phones and PDAs as a means for health promotion for people living with HIV in Peru. BMC Med Inform Decis Mak. 7(24):doi:10.1186/1472-6947-1187-1124. DeRenzi B BG, Jackson J, Kumar VS, Parikh TS, et al. (2011). Mobile phone tools for field-based health care workers in low-income countries. Mt. Sinai J. Med. 78:406-418. Feder JL. Cell-Phone Medicine Brings Care To Patients In Developing Nations. Health Affairs 2010;29:259-263. Hoadley C. (2002). Creating context: Design-based research in creating and understanding CSCL. Paper presented at: Conference on Computer Support for Collaborative Learning: Foundations for a CSCL Community. Boulder, Colorado. Mechael P BH, Kaonga N, Searle S, Kwan A, Goldberg A, Fu L, Ossman J,. (2011). Barriers and Gaps Affecting mHealth in Low and Middle Income Countries: Policy White Paper; http://www.globalproblems-globalsolutions-files.org/pdfs/mHealth_Barriers_White_Paper.pdf,. Schneider HH, van Rensburg D. (2008). Community health workers and the response to HIV/AIDS in South Africa: tensions and prospects. Health Policy Planning. 23:179-187.